Close to the airport there is the Hotel Mercur. It has a shuttle bus. We settle in a room here. 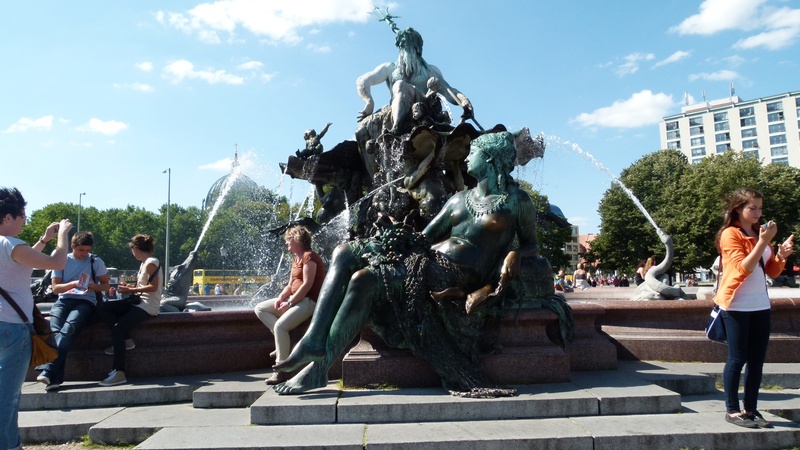 Then we take the bus to Bahnhof Zoo… to visit Berlin. Kaiser Wilhelm Gedächtniskirche – Ursula liked the blue modern church. The memorial place is open and we learn that they considered to rebuild the church from 1890. S-Bahn to Hacke’scher Markt. We stroll through the Hacke’sche Höfe and we like the Freitag Shop. 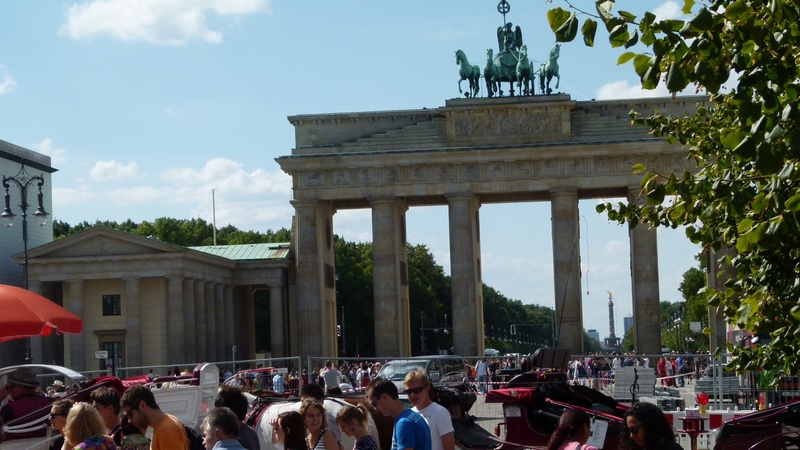 Then we walk to the Museumsinsel, Gendarmenmarkt and Brandenburgertor. I show once more, where the wall ended separating the two towns, as I have always done for Ernst. Is the minister so… that he takes the whole plane? Well… let us hope we make it to Mongolia tomorrow, after having enjoyed our short walk through Berlin. From my cosy Literaturhotel in Friedenau I walked to Schlossstrasse and through the Treitschke Park (very nice layed back streets where must be good to live) to the Breitenbachplatz. By looking at the map, I expected a footwalk of half an hour, but Mum you are right… it was almost an hour. The Breitenbachplatz is surrounded by houses under monument protection. I met a friend here. Alfred Grenander was the architect of the U-Bahn or metro in Berlin. He was a very thoughtful architect. Each metro station has tiles in a different color. 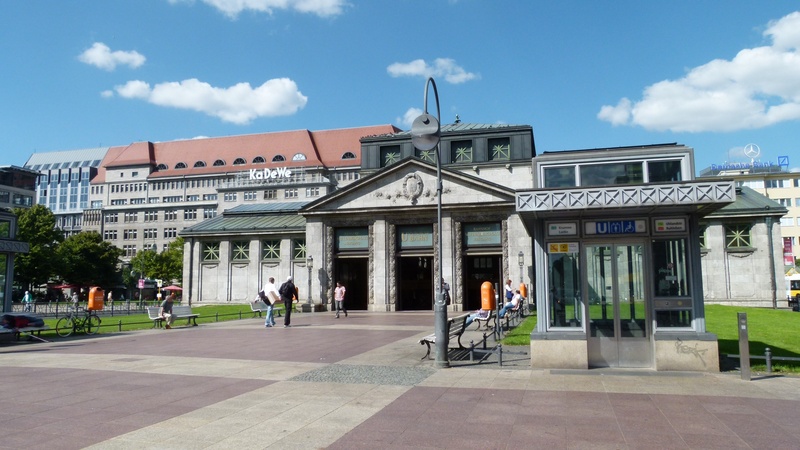 And at Wittenbergplatz the station is covered by a nice modern style building. 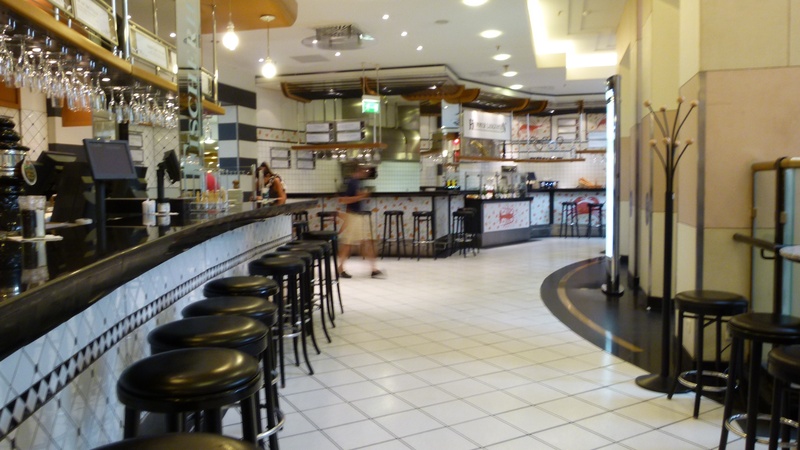 I say hello and move on to the top floor of Kadewe, which hosts one of the greatest gourmet food stores I know. It is time to eat. 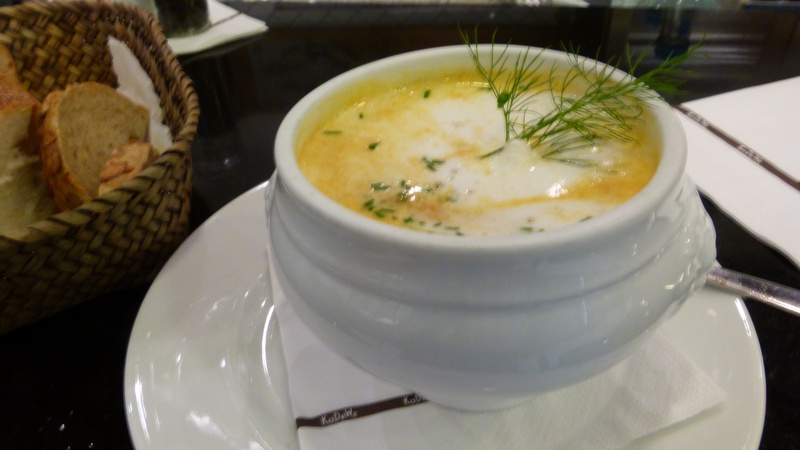 I enjoy a delicious shrimp soup from Büsüm (Sylt). 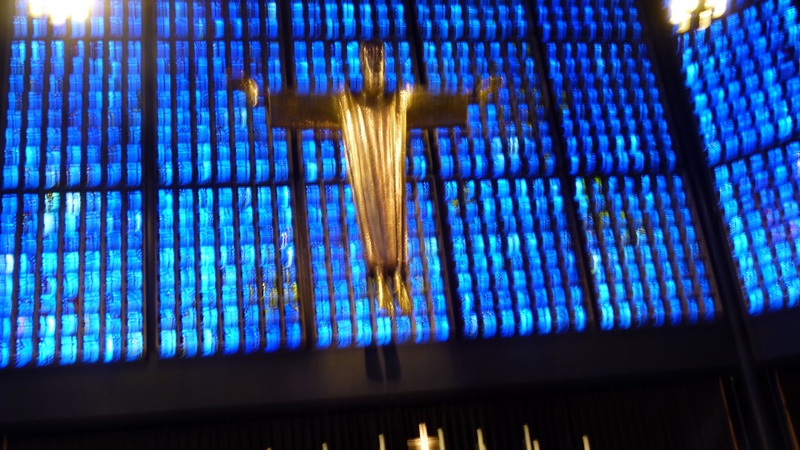 I love the dark blue ambiance in the new church of the Kaiser Wilhelm Gedächtniskirche; due to its shape the church is also called “powder box”. The original church has been left as a ruin, and now it is completely hidden behind scaffolds. Around the church are many, many souvenir and curry sausage kiosks. And the whole Ku’dam area is under construction. I take the S-Bahn (town train) and through the window I proudly look at the Swiss embassy that stands in the middle of the German government area (there are rumors that the German government wanted to acquire the land from Switzerland, without success). Train station “Hacke’scher Markt”. I stroll through the many courtyards of what is called Hacke’sche Höfe and buy ear rings. I love the atmosphere with restaurants, galleries, small shops for jewellery, clothing, soap, and – one of my prefered shops – the Ampelmann (the red and green man in the pedestrian crossing traffic light of Berlin). Ernst also loved this shop and we have a mouse mat from them. 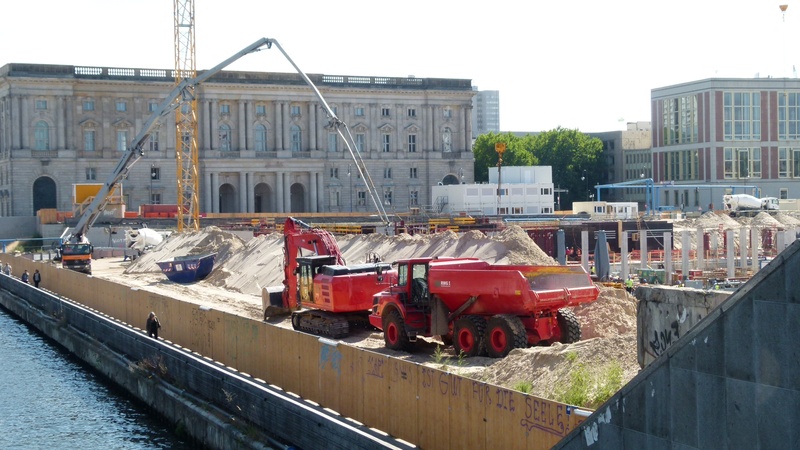 Construction is going on here as well… “in Berlin wird jebuddelt”. I continue to walk. What is this? A huge huge hole… it is the hole that the Palace of the Republic has left. There is an information booth called Humboldtbox. Later Antoinette tells me that they plan to rebuild the castle and are now digging out the fundaments. I turn to the German History Museum. For 8€ I stroll through German history until 1918. Well curated. There are panels giving a brief overview of the period and next to it, there are the artefacts from the time or pictures and later fotos about it. Destroyed diversity also has a special exhibition. I always feel ashamed for my German roots, when being reminded of what happened 80 years ago: The propaganda, the denunciation of those being perceived to be different and then the subsequent mass executions. I came across Carl Peters who had been integrated in the national propaganda, as he had founded the East African colony (though he died in 1918). The Nazis made a film about him in which the former Askari from Kenya, Bajume Mohammed bin Hussein, fought on the side of Hans Albers. Shortly afterwards he was arrested and died in the camp. 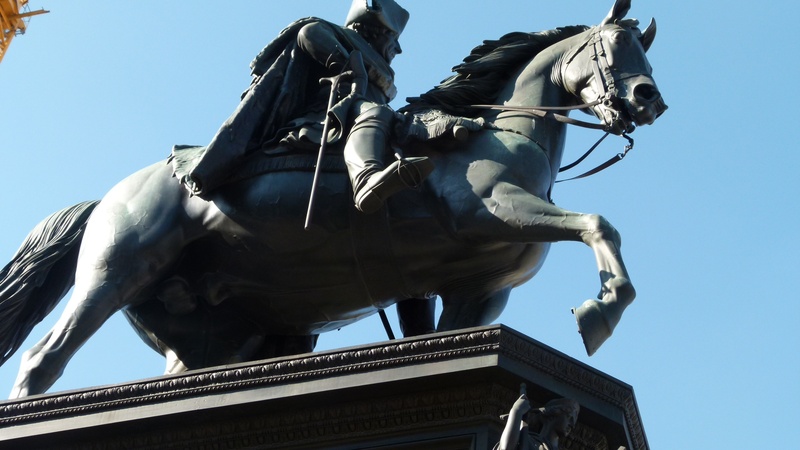 I stop by at the monument of Friedrich the Great in Unter den Linden, greet him and apologize that this time I will not visit him in Potsdam and in his pretty castle Sanssouci. … and then I take the S-Bahn back to Friedenau. My mum was always proud of the S-Bahn that proves the vision of the government of Berlin in the early 20th century… it allows to overcome the large distances in Berlin efficiently (much quicker than by walking). The Gendarmenmarkt is one of my favorite spots in Berlin. Memories are tied to it. Around 1966, there were three black ruins here, and my mum (she knew the past beauty of this square) was very sad. 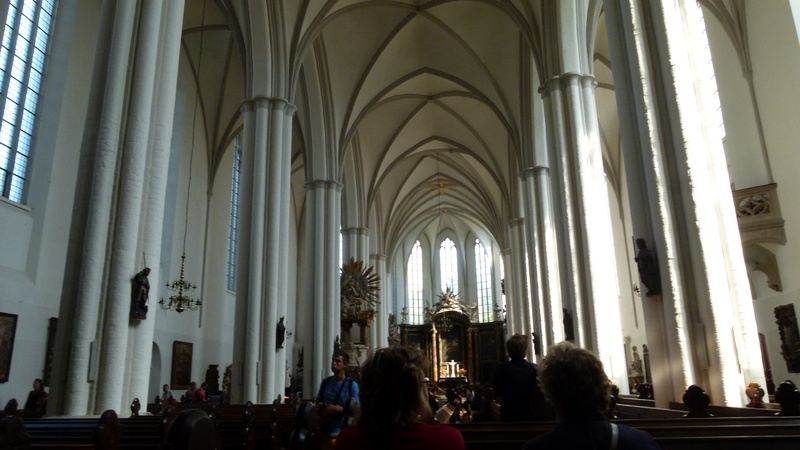 When I came back in the 90’s, the cathedrals were beautifully restored. Ernst and I visited the museum about the Huguenots that Friedrich the Great had welcomed in Berlin. The French Cathedral was for them. Back later again… with Ernst in the Konzerthaus. And today, Antoinette takes me to the French Cathedral. Two priests are reading about the diversity in literature that has been destroyed 80 years ago (Dr. Jürgen Kaiser and Dr. Matthias Loerbroks). Here are two thoughts that I took with me. 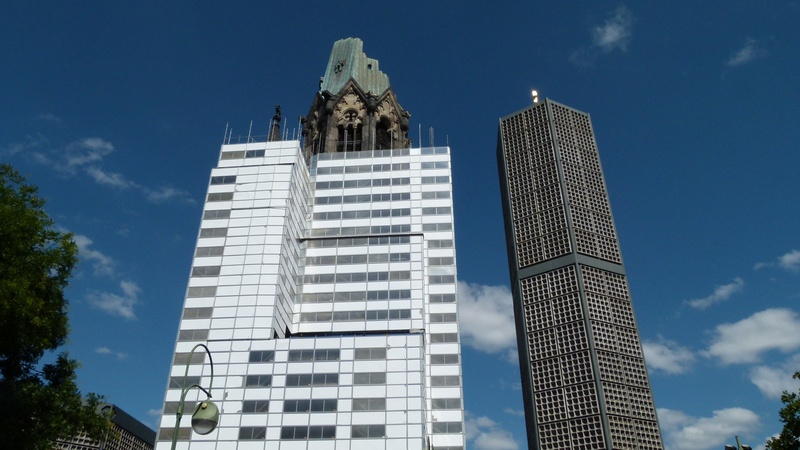 Berlin 80 years ago and Babel in the bible have similarities. Both towns longed for unity… unity of language, unity of thought, unity of the peoples, unity of art, unity of architecture (symbolized by the one tower of Babel). Yes, unity is easier to handle than diversity which is complex. But the bible condemns such unity and says that destroying diversity is sinful. Diversity is what the bible asks for… diversity is, the priests say, what God wants. But 80 years ago Berlin became a second Babel and destroyed diversity. Sorely, the priests admit that the church then supported the destruction of diversity. 80 years ago Berlin burnt books that did not conform to the unity of thought, not far away from the cathedral. The bible describes a similar burning of books. In Jeremias 36, God asked Jeremias to write down the history of Israel and Juda. The text was read out to Jojakim, the king of Juda. He cut the written text into pieces and burnt it. But Jojakim could only burn the written text, not the words. Jeremias wrote them on paper again. Similarly burning books in Berlin just destroyed the written text, but not the words and thoughts. Master burns his book about Pontius Pilatus that had not been accepted for publication. Towards the end of this wonderful story, at the devils’ party, the devil Voland pulled Master’s book from the fire and says that his manuscripts cannot be destroyed. Did Bulgakow have Jeremias 36 in mind, when he wrote this? And, I understand, that this was a hidden hint to another ruler who tried to destroy diversity. 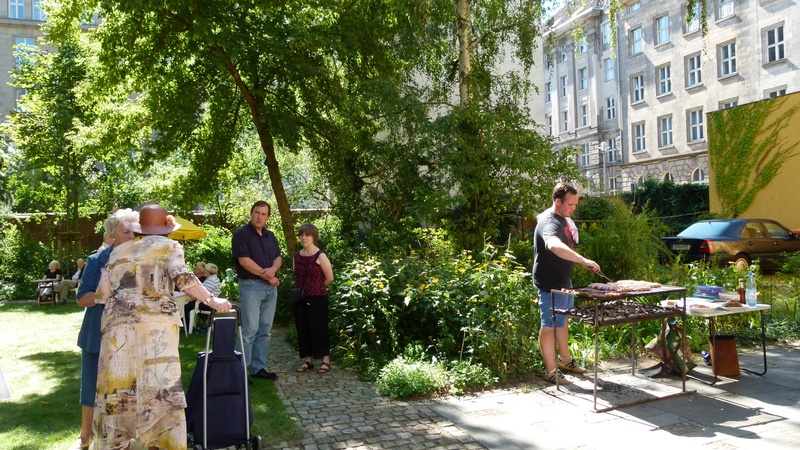 Dr. Kaiser invited the community into the garden of the parish hall in Taubenstrasse, where barbecue, salad, water, cake and coffee were waiting for us in the warm sun. We all sat together and chatted. Now, Dr. Kaiser will read “Master and Margarita” – his organist (from the former GDR) promised to lend him his copy and confirmed enthusiastically that it is worth reading. Jo dö könned mir jo gly Schwyzerdüütsch rede “Ahm, then we can speak Swiss German right away,” the charming young lady says, as she hears our first words. Antoinette and her husband had taken me into the restaurant “zum Schwiizer” in Zeesen, some 40km south of Berlin. 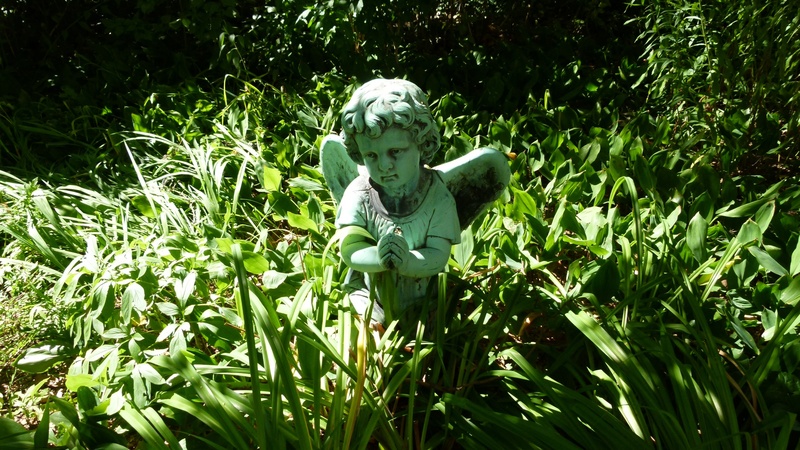 We sit in a nice garden in the warm sun, and obviously Antoinette and I could not hide where we are from. The owner welcomed us in Swiss German. We order Läberli (liver) and Zürigschnätzlets (meat cut into strips in cream sauce) with Röschti (similar to hash browns) and e Gmüeswäie (vegetable pie). We also take Valser Wasser (mineral water from Vals in the Swiss mountains) and Rivella (is made from milk serum and is a drink invented in Switzerland in 1952). which of these dishes do not contain potatoes: Hääperebrägu, Rüeblitorte, Gschwellti, Härdöpfustock (it is “Rüeblitorte” that contains Rüebli or carrots, but not potatoes). or translate please: Jetzt faart dä Löli uf em Troittoir, derbii schtoot e Tschugger hinterem Egge. (Now this idiot runs his bike on the pedestrians’ walk, but there is a policeman behind the corner). or which of these products have not been invented in Switzerland or by a Swiss? The two stroke engine, democracy, the zip fastener, Chevrolet cars, the bicycle chain, the PC mouse, LSD, aluminium foil, the velcro fastener, the turbo charger, the spam and the LCD display? Answer: The spam – and I somehow think this is not a product, but a nuisance… or did they mean Spiced Pork And Meat – canned precooked meat? Antoinette’s husband rolls his eyes, as also Germans have a hard time to understand the Swiss dialects. We enjoy our very Swiss experience here close to Berlin. 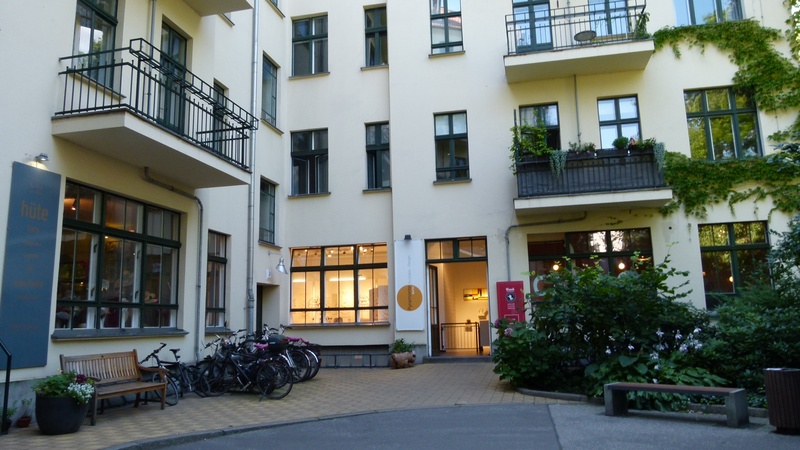 We can recommend this restaurant & pension which is just near the regional railway station of Zeesen with a direct connection to the city center of Berlin (website http://www.zum-schwiizer.com). The young couple running it met in Switzerland, he being from Berlin and she from the Swiss canton of Thurgau, and they decided to start their own business here. Huns and Attila, Turks, Chinggis Khan and his horsemen conquering Europe and Asia, the Moguls in India, the emperors in China – to connect up the links between all these fragments of knowledge about Mongolian history, Ursula and I spend a sunny afternoon in the garden of my mountain apartment. We felt like back in our school days some 40 years ago, when ploughing through the guide books (Dumont, Lonely Planet and more) and when surfing through the Internet with Drs Google and Wikipedia. This is what we found – and we may have misinterpreted some of the complex facts while trying to make a short overview. (1) The Huns and Attila around 400 AD left their steppes. In 450 the empire of Attila stretched from Korea to Germany. (2) Turkish/Uighur tribes blended their nomadic life and agriculture. There are ruins of their small cities in the Orkhon valley and a monument near the Lake Ögoi reminds of Bilge Khan, their greatest leader. Their empire reached out to the Meditarranean. It existed until around 840. The Uighurs were then expeled by Kyrgyz tribes (also Turkish) and migrated to the east, where they controled part of the silk road for the next 1000 years. (3) In the early 13th century, Chinggis Khan unified the rival Mongolian tribes. He built an army of horsemen (9×10’000 and a personal guard of 10’000). Chinggis Khan and later his son and successor Ögodoi Khan conquered an empire from Korea to Hungary and from India to Russia. Ögodoi founded the capital Karakorum in 1241. Around 1270, Kublai Khan divided Mongolia into four regions called khanats. First Central Mongolia, second China (where Kublai Khan created the Yuan dynasty described by Marco Polo; Kublai’s dynasty lasted until 1368), third Russia (the Golden Hordes, later beaten by Dimitrij Donskoj in 1380), and fourth Persia (converting to the Islam and around 1500 creating the Mogul dynasty in Northern India). In the second half of the 14th century, most of the Mongolian rulers had retreated to Mongolia, both from the West as well as from China. The now rival tribes were unified once again by Mongolia’s greatest queen, Manduhai. The Mongols revere her even today. In 1585 Altan Khan founded the monastery (khid) of Erdene Zuu, after having coverted to the yellow hat buddhism influenced by Phagpa, a Tibetan buddhist. The Mongols supported their neighbors, the Manchus, to conquer China and establish the dynasty of the Quing. Nevertheless the Mongols became a people colonised and oppressed by the Chinese. The Quing were overthrown in 1911. They were the last dynasty of Chinese emperors. Until 1990, Mongolia was mostly a Sowjet state. Their prime minister Gender bravely opposed Stalin and defended the monasteries, but he was executed and his successor then destroyed them. Mongolia used the cyrillic alphabet. In 1990, Mongolia (“outer” Mongolia) became independent and successfully established democratic rules. The former president has just been confirmed in the elections of July 2013 – he belongs to the democratic party. Friday 23rd of August. I am waiting for my Easyjet flight to Berlin. 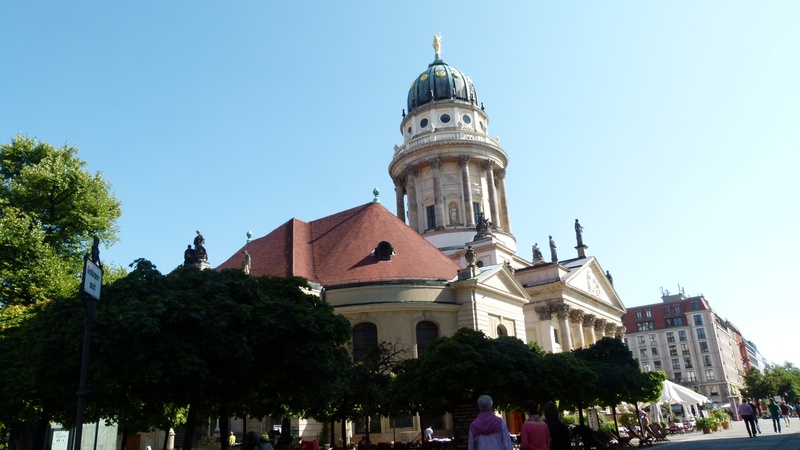 The plan: A few days in the town of my mother, Berlin. I love this town and I will meet Antoinette. Next week, Ursula will join us… and with her I will leave for Mongolia. We are all friends from the school days that we completed some 40 years ago. It is good to be with friends. A full month on the road again. I hope to find some Internet Connections to blog about the two Swiss traveling in Mongolia. Life has been breathtaking since I came back from Petersburg. Renovation in my house… I lived amidst piles of books, carpets and folders in the living room, while the first floor is empty to be overhauled. I did some consulting work for a few days… I enjoyed this change to my retirement and I plan to do more of this later.Then a person very close to me left this world… I am very sad. Now, I leave life at home behind me, with one more friend in my heart. Mongolia has always been a mysterious spot in this world for me. I came across the peoples from Mongolia, when learning about the Huns that invaded Europe (I once sat on the chair of Attila in Italy), about the Turks that invaded Anatolia (the ruins of the Byzantine cities were one example that told me about them). Then Chinggis Khan – he became a pop star in the 1980’s. I came across them in Russia as the “Golden Hordes”, in India as the Moguls (Sha Jahan’s Tadj Mahal shows how powerful they were). And China feared them, built the Great Wall, and could not prevent being invaded; the Mongols became even emperors of China. The mysterious peoples from the steppes. I look forward to discovering them and to understanding why I came across them in so many corners of this world. With Larissa I attended the opera “the flying Dutchmen”. I liked the opera, and I later said to Tatjana, my Russian teacher, that I liked it very much: “спектакль “Летучий Голландец” мне нравилась.” Tatjana rises her eye brows: “oh… so what happened? You do no longer like it?” – Hm, no-no, I liked it and I still like it. “Well, she says, so… you have to say: спектакль понравилась. Otherwise every Russian would think that you do no longer like it.” Okay, I understand, I have used the imperfect aspect and should have used the perfect aspect to make it all clear that I still like it and that the result has not been “canceled”. Tatjana and I sit at the table at home and practice the aspects. The door bell rings. I open the door. The neighbor looks for Elena, but as Elena is not at home, she leaves. Shortly afterwards Elena comes home. “Elena”, I say, “your neighbor came and looked for you… соседка пришла и искала тебя”‘. Tatjana frowns. “Where is the neighbor? Is she waiting in the kitchen?” – Hm, no-no, she is no longer here, she went away – она ушла. Conclusion: Result canceled, she left again, hence I have to say “она приходила”. Will I ever get this right? Tatjana and I practice the words “dress” and “put on”. Another trap here. I put on my trousers in the imperfect aspect means a scandal, if I left the house now. Because “надевала брюки” means that I put them on and then took them off again. I have to say “надела брюки” in the perfect aspect to express that I put them on and I am still wearing them. Did I make this clear? I think you have to be a native slawic speaker to understand this. Tatjana calls this concept “the canceled result” or “аннилурованный результат”. For Russians this is all easy, they just ask themselves: делал или сделал? (perhaps to translate like this: Did he process this or did he complete it”), but for me, this is still not straightforward. Larissa and my Russian friends are always puzzled, when I hesitate about using the correct aspect. Larissa remembers that she heard about the aspects at school a long time ago… and now corrects me as well. Another challenge – how to form the aspects? To remember that брать is incomplete I needed a ladder… My brother is not perfect. I do not have a brother and hence I am not offending anyone. Well, I try hard to get these aspects under better control, and I hope that my Russian friends forgive me and understand nevertheless, what I am trying to say.